La Santa Muerte is Spanish for ‘Saint Death.’ She is referred to by many other names as well, including Holy Death, The White Girl, The Miracle Worker, and The Skinny Girl. Santa Muerte is usually represented as a skeletal figure, clothes in a long robe and carrying one or more objects, often including a scythe and a globe. While the movement — which originated in Mexico but now also has a growing number of followers in the USA — is referred to as a cult (of Catholicism), it is not an organized religious group. Currently, devotion to Santa Muerte is the fastest growing religious movement in all of the Americas. Andrew Chesnut, the foremost authority on Santa Muerte, is among those who consider it to be a New Religious Movement. The Santa Muerte cult could probably best be described as a set of ritual practices offered on behalf a supernatural personification of death. The personification is female, probably because the Spanish word for death, muerte, is feminine and possibly also because this personification is a sort of counterpart to the Virgin of Guadalupe. To believers, the entity exists within the context of Catholic theology and is comparable to other purely supernatural beings, namely archangels. The cult involves prayers, rituals, and offerings, which are given directly to Santa Muerte in expectation of and tailored to the fulfillment of specific requests. These bear some resemblance to other traditions. The origin of the cult is uncertain; it has only been expanding recently. The cult appears to be closely associated with crime, criminals, and those whose lives are directly affected by crime. Criminals seem to identify with Santa Muerte and call upon the saint for protection and power, even when committing crimes. They will adorn themselves with her paraphernalia and render her respect that they do not give to other spiritual entities. There is, at least in English, a notable lack of academic literature about the Santa Muerte cult. However, due to its macabre charm, the cult and its devotees have received considerable attention in Mexican, Latin American, U.S., and even international news media. It also appears in Mexican government press bulletins, ranging from state-funded Anthropological studies of the cult itself to public arrest records concerning individuals connected to the cult. There are also a few internet sites maintained by cult adherents as well as published handbooks of cult rituals and traditions that are used by cult practitioners. The cult has been touched upon in anthropological studies of the symbol of death in Mexico culture. Although most of sources are in Spanish language, some have English translations. The term “cult” generally is used to refer to the people and practices associated with Santa Muerte. This can be attributed, in part, to the fact that Spanish-language sources consistently use the cognate “culto”. The term’s use does not entail the pejorative meaning of a strictly controlled, fringe religious group, led by a charismatic leader. Although the Santa Muerte cult certainly appears to be fringe, it does not appear to be a formal or controlled group, at least yet. Instead, the term cult really applies to the series of rituals and practices associated with religious worship, i.e. the physical as opposed to cognitive and/or mystical dimension of worship. In this sense, it is comparable to the cult of the Blessed Virgin in Christianity. Similarly, persons who worship Santa Muerte cannot accurately be called “members” of the cult, since there is no formalized or exclusive membership. The terms “devotee”, “adherent”, and “practitioner” seem to be more accurate and appropriate. There is also some theological and linguistic inconsistency over the term “saint”. Santa Muerte is certainly not a saint officially recognized by the Roman Catholic Church or, indeed, any other mainstream branch of Christianity. Nevertheless, other than worshiping her, her devotees do not appear to espouse any theological doctrine that greatly diverges from mainstream Catholicism. Many if not most practitioners seem to consider themselves to be, more or less, good, practicing Catholics. Unlike a conventional saint, Santa Muerte definitely appears to be the object of worship rather than a simple intercessor, which is a significant divergence from Catholic doctrine, although the actual practice is not unheard of in the mysteries associated with other Catholic saint traditions, at least unofficially. The name itself is easily confused in translation. 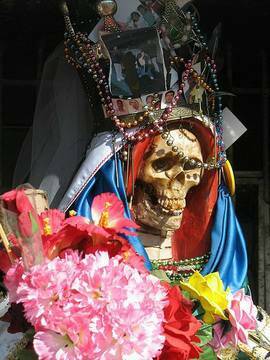 Some have translated Santa Muerte into English as “Saint Death”. Although this conveys the concept accurately, the correct literal translation is “Sacred Death” or “Holy Death”. Trailer for the documentary Saint Death (La Santa Muerte), directed and produced by Eva Aridjis and narrated by Gael García Bernal. Adherents of Santa Muerte come from all social sectors in Mexico, according to some observers such as Mexican author Homero Aridjis, who is also president of the International PEN organization. Even so, in violent prison riots and other disturbances over the last month in Mexico, the image and the growing influence of the death cult were obvious. According to Aridjis, criminal narco-traffickers are very religious and their shrines to Santa Muerte have been found during police raids on their homes and hideouts. Aridjis, who has written a novelized account of his contacts with the cult, says that its adherents include not only the most marginalized sectors of Mexican society, such as prostitutes and narco-traffickers, but also police officers and powerful politicians seeking deliverance or advantage over their enemies. However, Dr. Timothy Steigenga, renowned religion researcher at Florida Atlantic University, averred that the cult’s adherents come from a population segment he designates as “unaffiliated” to either the Catholic Church or the numerous, and growing, Protestant churches in Mexico and Central America.